Regular readers of the site will know I’m a big Lonnie Smith fan. He keeps putting out great work year after year, and his latest Blue Note release Evolution is another feather in his turban. The band keeps it funky from front to back, with enough surprises thrown in to make sure I’ll keep the album on rotation for a long time. This energetic update of Monk’s “Straight No Chaser” breathes new life into a standard that some jam session veterans feel has been done to death. I personally have always found the melody to be rhythmically hip, and now it’s got some changes to match. This entry was posted in Uncategorized and tagged jazz, lead sheet, Lonnie Smith, music, Noteheads, Straight No Chaser, transcription on March 28, 2016 by noteheads. Here’s a fast & funky one from Dr. Lonnie Smith’s Spiral. 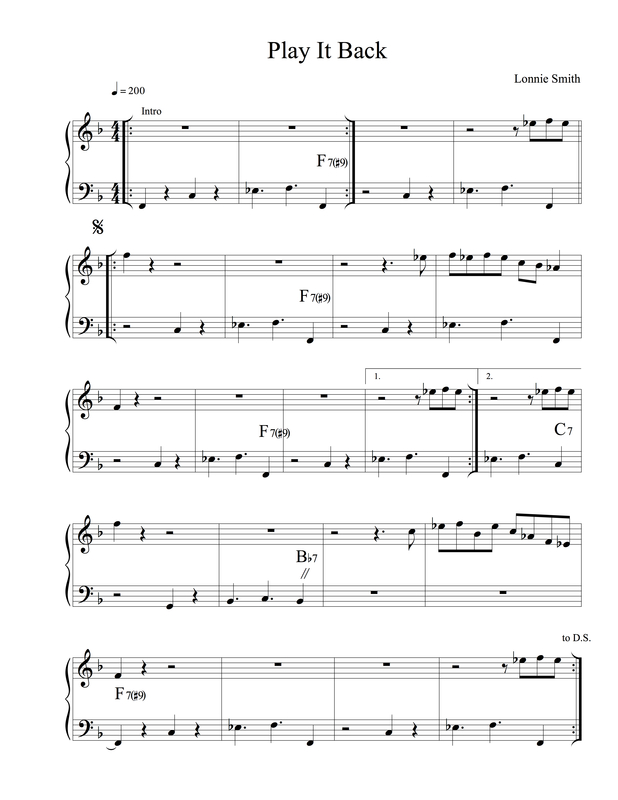 This entry was posted in Uncategorized and tagged Beehive, jazz, lead sheet, Lonnie Smith, music, Noteheads, transcription on August 20, 2015 by noteheads. I love playing the blues. The 12-bar blues is the quintessential American art form, and probably more ubiquitous than any other. It appears in every style of music I can think of, and new genres in the 21st-century will undoubtedly adopt it as well. I could play the blues all day and night and never repeat a song; I wouldn’t be surprised to learn that half of all the jazz tunes ever written have been based on the 12-bar blues. “Play It Back” is a 24-bar blues by the great organist Lonnie Smith. Unlike most blueses, it never goes to the “4” chord but stays on the F chord until it goes to the turnaround. I’ve played this at many gigs because it’s easy, fun and funky, but the band usually solos on the standard blues. I find the blues form is so ingrained in most people’s minds it’s harder for them NOT to play the 4 chord. On his Live at Club Mozambique recording the composer himself accidentally plays it a few times. 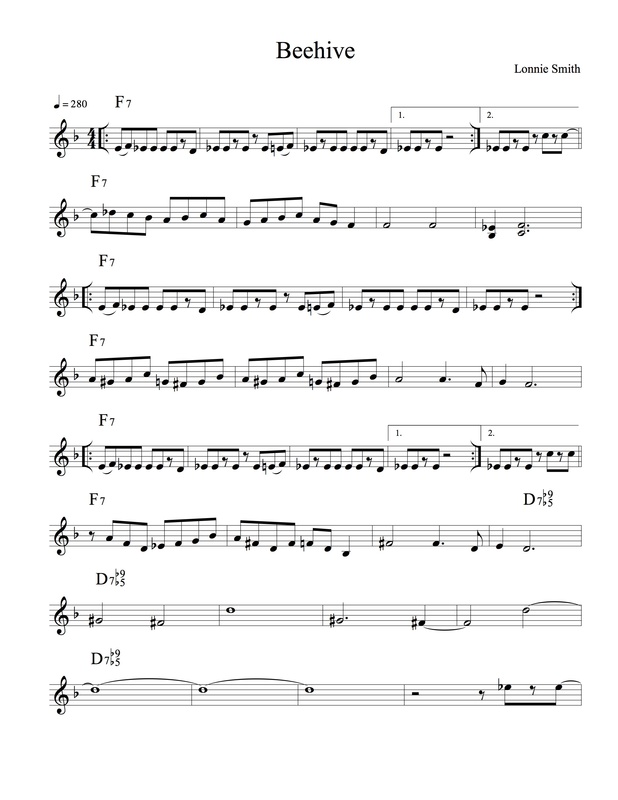 This entry was posted in Uncategorized and tagged jazz, lead sheet, Lonnie Smith, music, Noteheads, Play It Back, transcription on April 27, 2014 by noteheads.